Disclosure of Material Connection: I received this a DVD to give awayfree from Family Christian Stores through the Family Christian Blogger program. This post does contain affiliate links. I was not required to write a positive review, and any affiliate relationship does not impact my opinions. The opinions I have expressed are my own. I am disclosing this in accordance with the Federal Trade Commission’s 16 CFR, Part 255: “Guides Concerning the Use of Endorsements and Testimonials in Advertising. We love Buck Denver in this house. In fact, the couple of titles of What's in the Bible that we don't already own are going to be showing up tomorrow morning as Christmas gifts. When Family Christian offered me a chance to review this DVD and give away an appreciation certificate, I asked if I could do a give away for the DVD instead, and they didn't need to send me one. So that is what I'm doing here. Buck Denver asks... What's in the Bible? Vol. 1 is a fantastic resource that everyone should own. Phil Vischer (one of the creators of Veggie Tales) is simply fabulous in this series. The entire series (13 volumes) covers the entire Bible, in a format that is great for absolutely all ages. My daughter started watching when she was around 3, and it certainly works for adults too. Each volume of What's in the Bible includes two episodes, lasting 25 minutes each. That means there are 26 episodes to get through the entire Bible. The first two episodes cover just what is the Bible (episode 1) and primeval history, Genesis 1-11 (episode 2). Michael - a kid in the backseat of a van, who is "watching" What's in The Bible while traveling to Grandma's house. He introduces each segment. Buck Denver, Man of News. In a suit and tie, he "runs" the episode. Clive and Ian. They're dressed in safari-like garb, have British accents, and are probably the absolute favorite of everyone in this house. Ian especially. He is always coming up with lines like, "My toaster doesn't have a love button." I know, it isn't funny if you haven't seen the episode. Chuck Waggin. He's into country music, from the Bible Belt, and always has his 'gee-tar' with him. Great songs, and he's a lot of fun. Sunday School Lady (and her Magic Flannelgraph) is a little old lady who has taught Sunday School forever, so she will often be called upon to tell a story or explain what is going on. She is adorable. Winifred and Agnes are two old ladies who are watching the show on the television in their living room. You know the old guys from The Muppet Show? The ones who sat in the balcony and heckled everyone on stage? That is these two. They cut in with comments about how things are going. Stuff like, "Good heavens, Winifred! Only two minutes in, and it's already a train wreck!" They rank just below Clive and Ian in my "favorite" list. Pastor Paul is a piano-playing preacher who is also called on to explain things quite a bit. He's kind of the theology guy. He is likely to be one of the folks who explains the "big words" used. I love that they use big words. He'll talk about the Latin and Greek roots. Dr. Schniffenhousen is a scientist, and he doesn't show up all that often. When he does, he is a lot of fun though. Brother Louie brings a Southern Gospel or maybe a jazz flair to the show. I love Brother Louie. There's a touch of the 'what does this mean to me today' about this character. Cap'n Pete is a pirate, and in Volume 1, his role is to talk about church history, the time in between Jesus and now. He talks about how the books of the Bible were determined in this volume. Later, he takes on a bigger role. Chester is one we don't really see, but he tells stories using popsicle stick puppets. He is very funny. In the second episode of this volume, he tells of Adam and Eve, mentioning the fact that they didn't have any clothes, which is why they always have to hide behind bushes when their pictures are taken for Children's Bibles. There are also three real people who appear in the episodes. Phil Vischer answers a lot of questions and helps to move things along. He's amazing, of course. The Bentley Brothers sing a song or two, dressed up in crazy Elvis-ish costumes. The songs are great, and the two of them grow on you. One thing I love, which you saw a bit of in the above clip, is that they keep things fairly relevant to today. Showing multiple Bibles, including one on an iPhone. Talking about books like Pat the Bunny. Or games like Tetris. Mentioning pop culture (American Idol or Green Lantern), or alluding to Finding Nemo, Star Wars. Or things like patterning characters after Elvis or the hecklers in the Muppets. Another great thing is that the humor appeals to multiple ages. At one point, Sunday School Lady is singing a song, and she tells Magic Flannelgraph to take a verse. Of course, we hear nothing. And she says something to him about how she'll sing instead, because he's flat. That joke went totally over the heads of my youngest kids, as they weren't grasping the double meaning of the word "flat" at all. There is also a church edition, and I am really wanting to use that in our Sunday School. Each volume contains four weeks worth of lessons. I think working through these would be a simply fantastic way to spend a year. Intrigued? You could win a copy! I have never seen this DVD before-my kids would enjpy it. We have Volume 10 (Jesus is the Good News), and we love it! 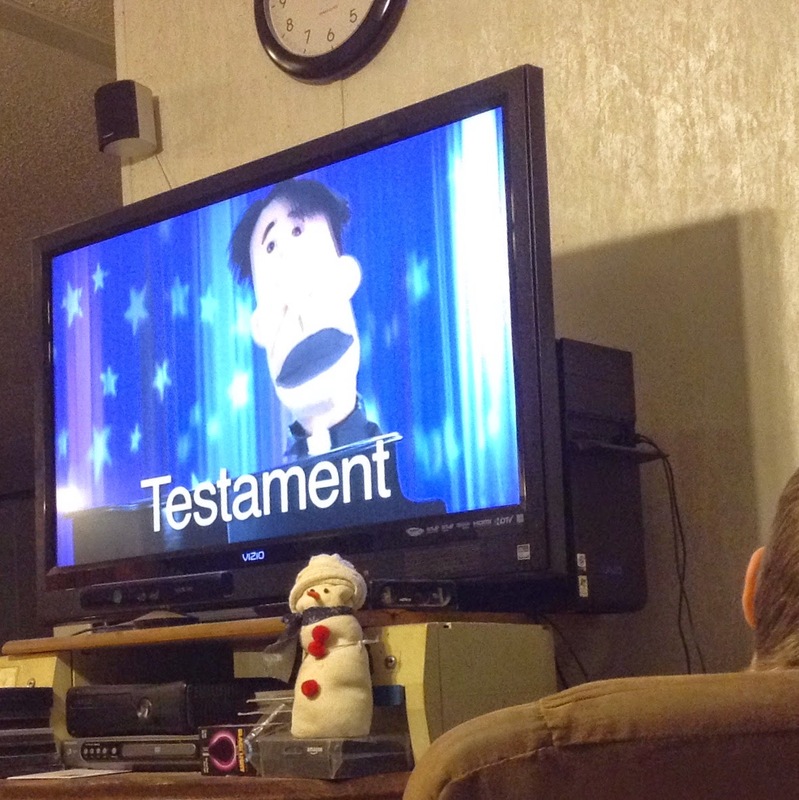 My boys are constantly asking to "watch the Bible" or "watch puppets." 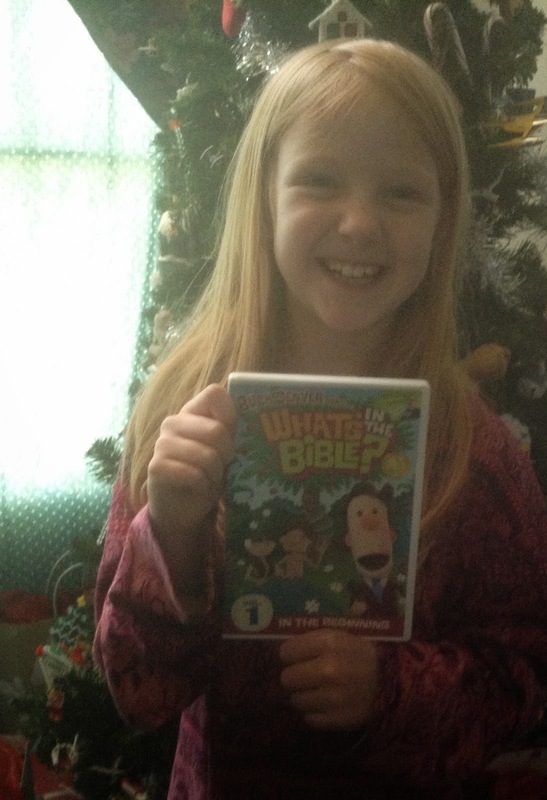 The Why Do We Call it Christmas dvd also made its way under our Christmas tree, but we haven't had a chance to watch it yet. I really appreciate that these are fun, but not at all watered down! We still love VT and are fans of Phil Fischer....but have NEVER seen a WITB episode! Crazy. Is it as cold at your house as it is at ours today? A magpie landed on our fence and looked twice his normal size with his feathers all puffed out! We love Buck Denver! We have the Christmas DVD and Volume 10, the first one in the New Testament, but haven't seen this one! Thanks for the giveaway!